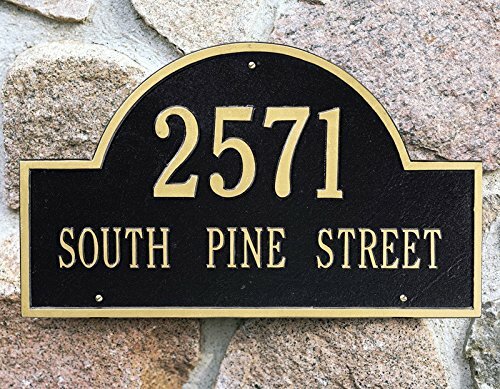 Address plaque.-Hand crafted from lightweight, rust-free cast aluminum.-Line One: Holds up to five 3'' characters.-Line Two: Holds up to seventeen 1.25'' characters.-Due to the nature of this product, customized orders cannot be returned or cancelled once order is placed.-Made in the USA. Color/Finish: -Finished with specially formulated weather resistant paints to last a lifetime. Dimensions: -9.5'' H x 15.75'' W x 0.5'' D. Warranty: -1 year limited warranty against manufacturer defect. 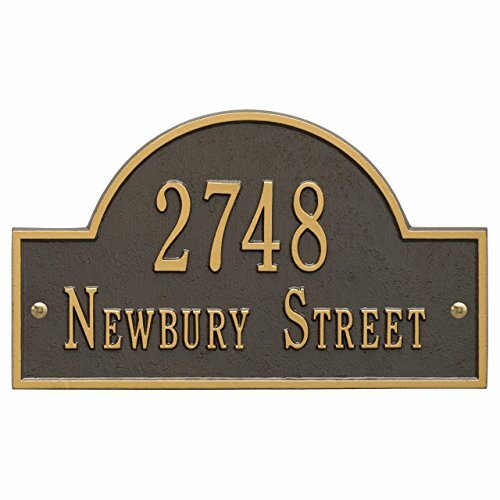 1004+OG Finish: Bronze and Gold Features: -Address plaque.-Hand crafted from lightweight, rust-free cast aluminum.-Line One: Holds up to five 3'' characters.-Line Two: Holds up to seventeen 1.25'' characters.-Due to the nature of this product, customized orders cannot be returned or cancelled once order is placed.-Made in the USA. Color/Finish: -Finished with specially formulated weather resistant paints to last a lifetime. Dimensions: -9.5'' H x 15.75'' W x 0.5'' D. Warranty: -1 year limited warranty against manufacturer defect. 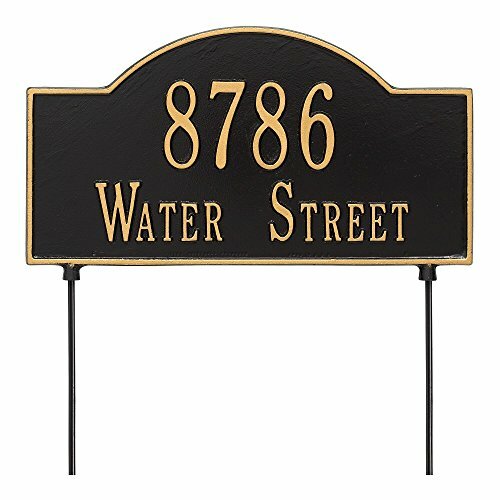 1044+BG Finish: Black and Gold Features: -Address plaque.-Hand crafted from lightweight, rust-free cast aluminum.-Line One: Holds up to five 3'' characters.-Line Two: Holds up to seventeen 1.25'' characters.-Due to the nature of this product, customized orders cannot be returned or cancelled once order is placed.-Made in the USA. Includes: -Includes two 18'' lawn stakes and hardware. Color/Finish: -Finished with specially formulated weather resistant paints to last a lifetime. Dimensions: -22.25'' H x 15.75'' W x 0.5'' D. Warranty: -1 year limited warranty against manufacturer defect. 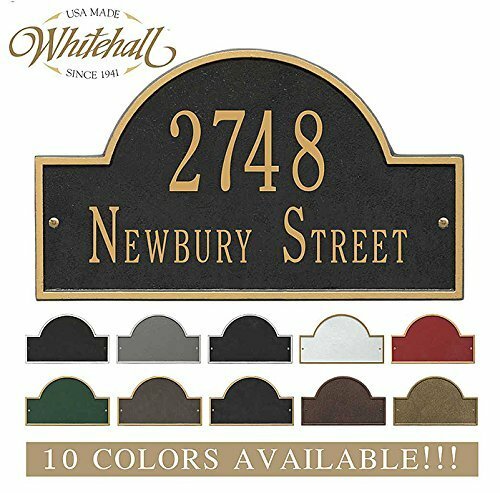 The Whitehall Products Arch Marker Address Plaque will accentuate your home's exterior with elegance. 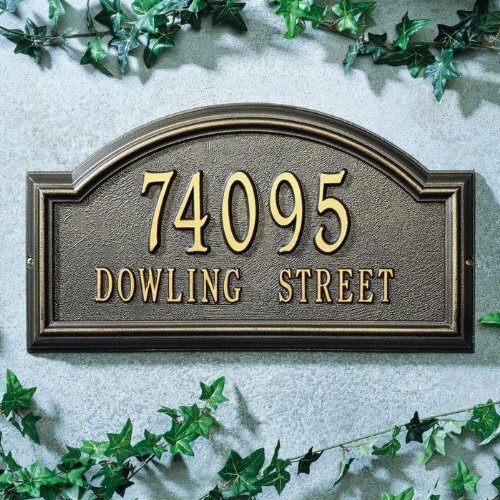 The address plaque is made from rust-free cast aluminum providing excellent quality. The plaque has a stylish arch shape Please choose carefully since this is a custom order it can not be cancelled, changed, returned or refunded. Providence Two-Line Arch Wall Marker Sign. 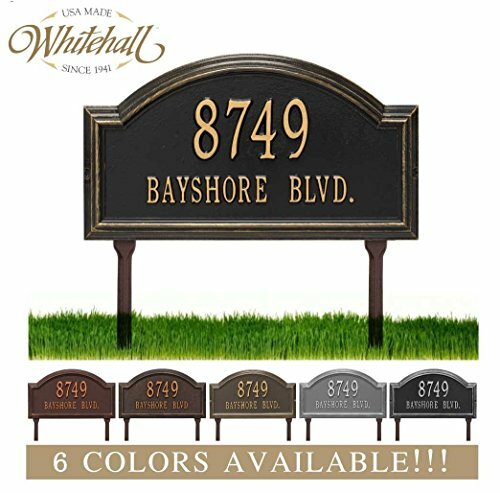 High quality aluminum address signs will add a rich, classic touch to any home Hand-crafted aluminum address sign is cast from rust-free, recycled aluminum and painted in an all-weather baked on finish. A framed border adds a rich, classic touch to this plaque. Available in standard and estate sizes, for wall application. 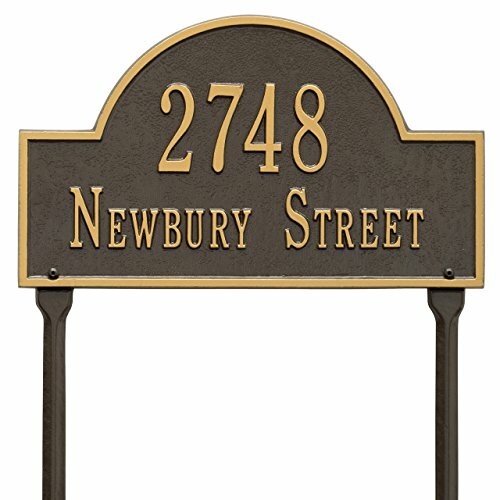 Signs are extremely attractive, durable, and made with the highest quality to last for many years to come. Two 18" lawn stakes and hardware are included with the lawn signs. 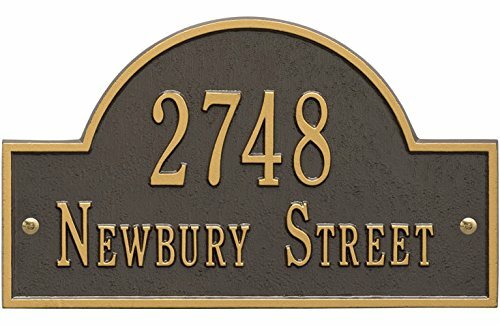 Standard Wall Plaques specify up to five, 3" characters/spaces on the top line and up to fourteen, 1.25" characters/spaces on the bottom line. Standard Sign Dimensions: 17" W x 1.25" L x 9.5" H Estate Wall Plaques specify up to five, 4" numbers/spaces on the top line and up to fourteen, 1.75" characters/spaces on the bottom line. Estate Sign Dimensions: 22.5" W x 1.25" L x 12" H : Weight: 2 lbs.